• The number of playoff rounds increases from three to four. The top two seeds receive a bye to the semifinals (third round), and the third and fourth seeds receive a bye to the second round. • Teams will be re-seeded after each postseason round. • The first and second rounds are single elimination. In the first round, the No. 5 seed hosts the No. 8 seed and the No. 6 seed hosts the No. 7 seed. In the second round, the No. 3 seed hosts the lowest-seeded first-round winner and the No. 4 seed hosts the other first-round winner. • The semifinals feature a best-of-five format, with the No. 1 overall seed playing the lowest remaining seed and the No. 2 overall seed meeting the remaining team. The Nos. 1 and 2 seeds will host Games 1, 2 and 5, and the lower-seeded teams will host Games 3 and 4 in their respective series. 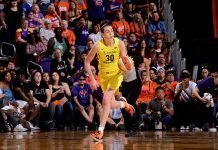 The WNBA Finals remain best-of-five and follow the same 2-2-1 format. • Each team’s opponent breakdown was selected at random and will be rotated annually to ensure a fair balance of the schedule. • The opponents for the two formats have been selected at random and will be reversed annually.